Our shaker styled storage bench has room to stow your magazines or your mittens. The storage compartment is 5" deep and 17 3/4" High x 11" Deep. Length is by the inch from 24" to 48"
Our cherry benches are finished with a hand rubbed natural oil finish. Our hard maple benches are finished only with a clear finish. Our painted benches are built from Poplar in your choice of 56 Milk paint colors. We also now offer 3,645 Benjamin Moore paint colors! 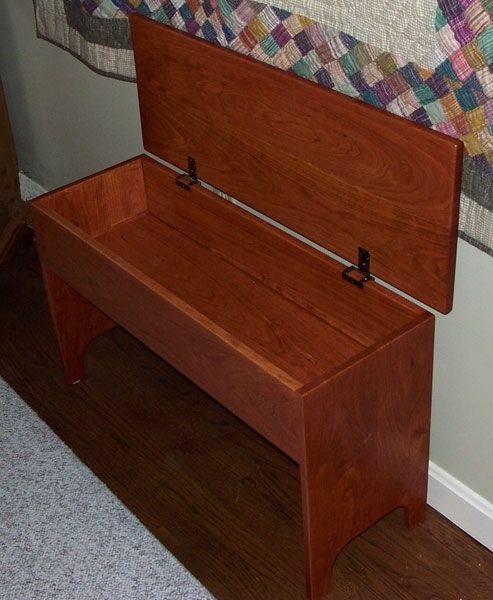 Our stained white oak benches are finished in your choice of 9 beautiful stains. All are finished with a satin polyurethane top coat.